On your arrival at Bangalore, India you will be received by our representative who will assist you to your hotel and will also brief you about your tour. After handing over all the relevant documents and details of your tour, our assistant will leave you for a comfortable overnight Stay at hotel. Post breakfast, we will proceed for sightseeing tour to the city. The tour will cover Lalbagh, one of the finest botanical gardens of India, Cubbon Park and Vidhan Soudha. Later day free for your own individual activities and stay overnight at the hotel. Post breakfast, we will leave Bangalore and drive towards Mysore. E enroute visit Srirangapatnam, a small river island situated amidst of the river Cauvery. The place is best known for the Ranganathaswamy Temple and Tippu’s Sultan summer Palace. After taking a brief tour to Sri Ranganathaswamy Temple, continue your journey to Mysore. On arrival to the city, check into the hotel and stay overnight. After taking breakfast, start your tour with Mysore Palace with the Indo-Saracenic architecture is the main tourist attraction point here. From here, visit the Jaganmohan Palace Art Gallery which is famous for its beautiful collection of unique and antique art pieces. Next, take a tour to St. Philomena’s Church. In the evening you may visit the Brindavan Garden and the adjoining Krishna Raja Sagar Dam where musical fountains and colored lights transform this place into a magical fairyland. An overnight stay will remain scheduled at the hotel. Post breakfast; depart for your next destination, i.e. Hassan. En route visit Shravanabelagola, a famous Jain Pilgrimage has a 57 foot high statue of Lord Gomateshwara Bahubali, standing on top of a hill. After taking a brief tour here, continue your journey to Hassan. On arrival, check in to the hotel and after resting for a while excursion to visit the 1000 year old temples of Belur and Halebidu. The walls of temples are covered with an endless variety of depictions from Hindu mythology and dancing figures. The temple of Belur and Halebidu are proposed UNESCO world heritage sites. Post sightseeing, return back to the Hoysala village resort for night stay. After breakfast leave for Hampi – a UNESCO World Heritage Site. Treasuring the bewitching beauty of ancient Karnataka, the place is also a vast open museum of rich architecture, historical residues and ancient temples. On arrival, check into the hotel. Spend a day at your leisure. An overnight stay will remain scheduled at your hotel. After hearty breakfast, start your tour to give your eyes the delightful treat of marvelous architecture. 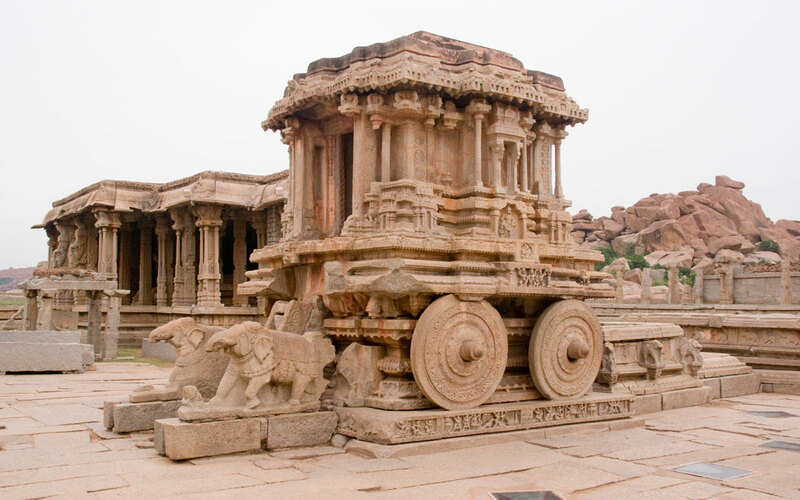 Once the capital city of the Vijaya Nagar Empire, the city of Hampi is said to be greater than the Rome as it had palaces; temple and sculptures spread all over in the area. Some of the interesting spots of these areas are: two-storied Lotus Mahal with recessed archways, the huge Elephant Stables and the splendid Vittala Temple, which comprises of magnificent pillared hall and the giant Stone Chariot thereby creating a true religious architectural treasure for this place. The Virupaksha Temple, which is still used for worship is also a hot tourist spot. Besides this, the Ugra Narasimha with 6.7 m tall monolith and the Mahanavami Dibba are also interesting spots to visit. Return back to the hotel for overnight stay. Post breakfast; depart for the next destination, i.e. Badami. En route visit, Aihole, known to be the first regional capital of the Chalukyas, the area has been defined as a crib of Indian architecture. On arrival, visit the Lad Khan Temple, dedicated to Lord Shiva, Kontigudi Temple and The Durgigude Temple, which got its name due to its proximity from the local fort. After taking a brief tour to this place, continue your drive towards Badami and en route visit the second capital of Badami Chalukyans i.e. Pattadakal. This UNESCO world heritage site has a group of around 10 temples which glorifies and enriches its history. On arrival to this place, take a tour to Virupaksha Temple, which is known for its affluent architecture and sculptures. The grandest and the largest temple among all 10 temples this temple is also significant because it narrates the episodes from the great Hindu epics, the Ramayana and Mahabharata. After exploring the glorious heritage and monuments at Pattadakal, continue your drive towards Badami. On arrival, check in to the hotel and enjoy your free time at your own leisure. An overnight stay will remain schedule in the hotel. After breakfast, visit Badami which was once the capital city of the Chalukyan Empire. The city is best known for its cave temples and red sandstone cliff. The craved sandstones, marvelous architecture and the ancient monuments make this place a favorite tourist spot among tourists. Overnight will remain schedule in hotel. After breakfast leave for Goa, also known as “Rome of the East”, the place is best known for its magnificent scenic beauty and the architectural splendors of its temples, churches and old houses. On arrival in Goa, check in to the hotel and spend your remaining day at your own leisure, overnight stay in hotel. After breakfast, proceed for the sightseeing tour of Goa with the major attractions Miramar Beach and world famous Basilika of Bom Jesus. Late afternoon it is the time to explore the city Panjim-bustling with shops or at leisure to relax on the beach, overnight stay in Goa. The day is to enjoy the great meals and exploring the beaches accompanied with free roaming for leisure and shopping. Overnight stay in Goa. Post breakfast transfer to Airport to board a flight to Mumbai. On arrival at Mumbai airport, driver will assist you and transfer to hotel. After taking a brief break get ready for the sightseeing tour of Mumbai. Visit the Gateway of India and from here, take a boat cruise to explore the beauty of Elephanta caves. Later return back to the hotel and stay overnight in hotel. After breakfast, visit the famous Prince of Wales Museum (now known as The Chhatrapati Shivaji Maharaj Vastu Sangrahalaya) further take a tour to Parliament House, Marine Drive, Jain Temple, Hanging Gardens and Crawford Market. An overnight stay will remain scheduled in the hotel.